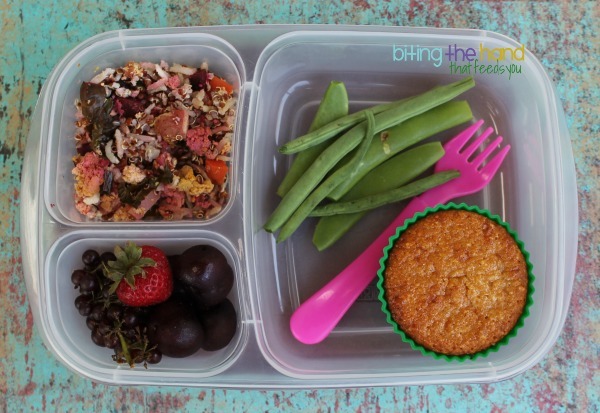 Biting The Hand That Feeds You: Leftovers for School Lunches! Leftover randomness! 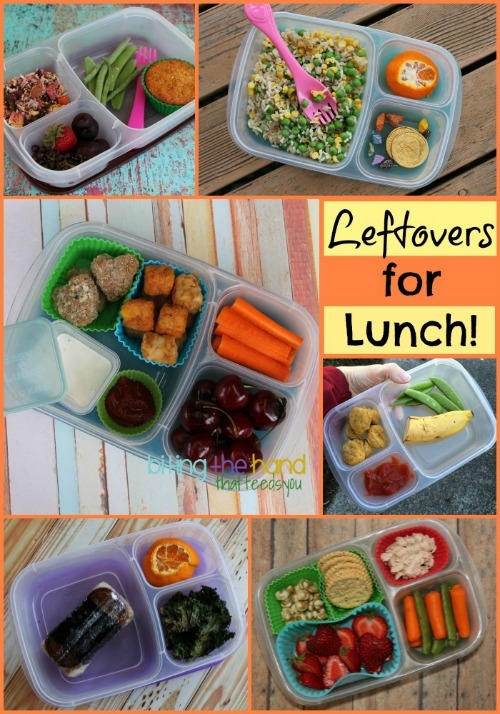 I'm not a huge fan of leftovers. Or kiddie comfort food, for that matter. So I fob off most of it on the kids (and my Hubby!) 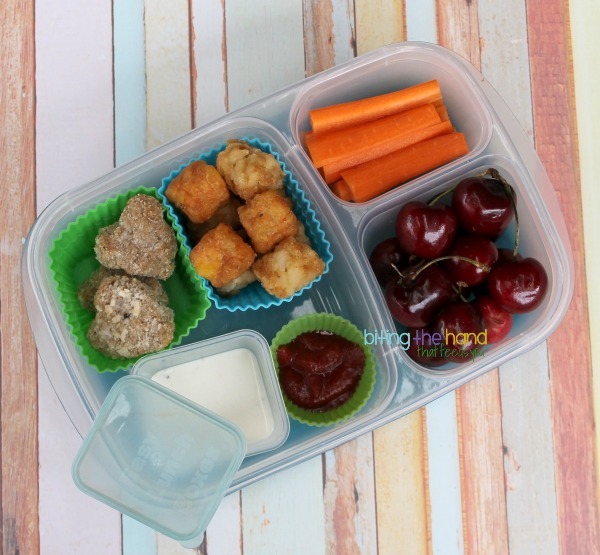 Something in their lunch that they like, and super easy for Mama to pack. Win! 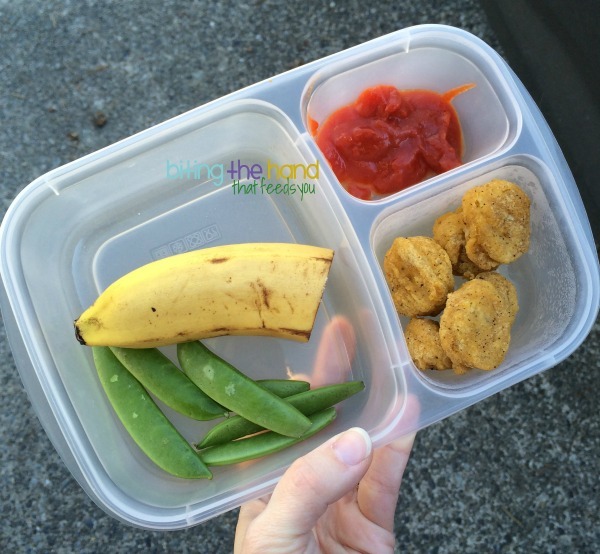 I still had some heart-shaped chicken nuggets left from making them for my post at MOMables. Had to be sure and include them in a lunch, right? I was helping test this recipe for MOMables' Chief Mom's new cookbook (available for preorder!) and had loads of cornbread muffins left over, since I made a gluten-free batch for me and the girls too. My older one doesn't seem to like anything I make for dinner, but the little one likes my randomness-in-a-pot meals. These leftovers are brown rice and quinoa, rainbow chard, crumbled tofu, carrots, plus probably onion and garlic and possibly other veggies. The girls love Dadda's tuna fish sandwiches - canned tuna with a dollop of mayo, made into a sandwich with sliced pickles (we buy dye-free ones, obviously!) Mama's too lazy to slice pickles, so *plop! 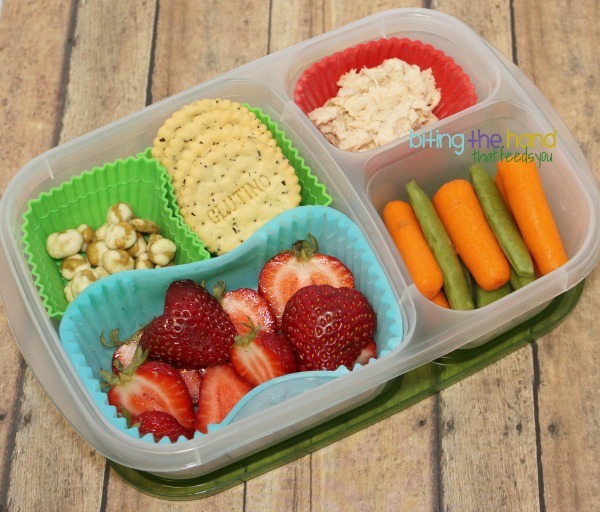 * Into the box it goes with some crackers and a spork for spreading. Ha! Can't figure out why I packed lunch for a Sunday, but I'm guessing a visit to Nana's! I seem to recall, one of the girls was screeching for her lunch, so I just snapped a quick pic of the other one. They both had the same thing. I'm guessing by the number of nuggets that this one was for the 5-year-old. We'd gone to dinner at a Hawaiian restaurant near Little Gym the night before, after Z's extra Practice Time class. 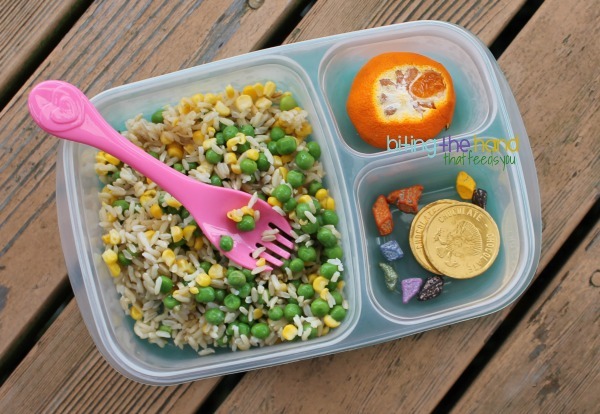 I tossed some frozen peas and corn in with leftover brown rice for E's lunch. She got extra candy in her lunch because she just would not get off my back while I packed a box of dye-free candy for Z's class cookie decorating party the following day. I had to promise I'd put it in her lunch before she'd let go of my leg! 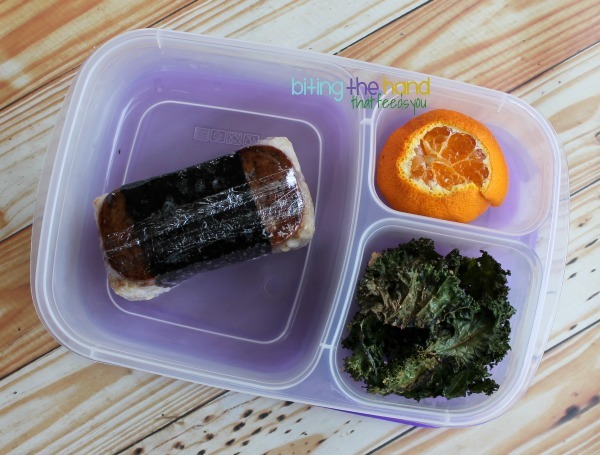 Z got the leftover SPAM and brown rice musubi. Sooo yummy! I normally eat vegetarian, but I have a hard time resisting these. My kids are voracious omnivores though. For the clementine, I used a little trick I saw shared on Instagram. Make thin slices across the top and bottom, just enough to trim the peel off, then slice down the side in between segments, and voila! The orange opens and separates much like pages in a book! I love the lunches! I'm a big advocate of using leftovers. I've wanted to pack tots before and found they get soggy in the box, any suggestions on how to avoid that?